"I'm very impressed with this program, and have happily started to receive dividends this month." - Bob V.
Happy New Year everyone and welcome to all of the new CDx3 Newsletter readers. Thank you all for your interest in Preferred Stock Investing. In the Last Month's CDx3 Investor Results article below, you'll find a summary of how 2007 went for CDx3 Preferred Stocks. I think that you'll find the results, when compared to the 2007 performance of bank certificates of deposit (CDs), particularly interesting. Hot News: Version 3 of the PreferredStockInvesting.com web site is now online! This month's Special Announce-ment article describes the new site and the free resources it offers to readers of Preferred Stock Investing. Another great American company is featured this month in the CDx3 Company Spotlight article. Learn more about the country's largest publicly traded owner of shopping centers and issuer of CDx3 Preferred Stock -Kimco Realty. The years of research that went into Preferred Stock Investing made it very clear that preferred stock investors were better off investing in new issues, then selling them within three years. The CDx3 Question Of The Month article explains why, and where you can get your hands on lists of the highest-quality, lowest-risk preferred stocks - CDx3 Preferred Stocks. For our new readers, there is a free calculator available to you that allows you to correctly calculate the effective annual return of preferred stock investments. The Free Special Offer article below provides you with a download link. Also, please be aware that the $30 Shell Gift Card offer that was available at PreferredStockInvesting.com expired on December 31, 2007. Keep an eye on this monthly CDx3 Newsletter for announcements of future promotions of CDx3 products and services. 2007 produced the strongest buyer's market that CDx3 Investors have seen in five years. The highest dividend payer was issued during August, offering an annual dividend rate of 8.0%. There were a total of 15 CDx3 Preferred Stocks issued throughout the year, with August being the busiest month with four new issues. By the end of 2007, CDx3 Investors were earning 62% more income than if they had put that same money in bank certificates of deposit (CDs). The subprime mortgage mess boiled over in June. Cash got harder to come by, so companies had to sweeten the deal for CDx3 Investors by offering higher dividend rates on CDx3 Preferred Stocks. Low Prices Set-Up 2008 Capital Gains: Another gift from the subprime mortgage mess to CDx3 Investors was that these high dividend-paying CDx3 Preferred Stocks could be purchased for bargain basement prices. There is a chorus from investment writers and analysts alike singing the praises of preferred stocks ("Abnormal Yields and Abnormal Value" - Merrill Lynch, The Fixed Income Digest Special Edition, November 21, 2007; "Preferred holders are sitting pretty." - Richard Young, Intelligence Report, January 2008). As explained in last month's CDx3 Newsletter, when large, institutional investors (pensions) were unable to figure out where, exactly, the subprime mortgage risk was going to bite next, they pulled billions of dollars out of the market and parked it in Treasury bonds and gold. The yields on Treasurys fell to two-and-a-half year lows while the market price of gold jumped from $640 an ounce to $840 (and climbing). And the market price of just about all other stock-related investments, including preferred stocks, fell as well. CDx3 Preferred Stocks that normally would sell for $26 to $27, fell to $23; some even lower. CDx3 Investors jumped in and purchased the highest-quality, lowest-risk preferred stocks (CDx3 Preferred Stocks), paying near 8% annual dividends, for bargain basement prices. It's Going To Be Great In 2008: There are many things that are unique about the subprime mortgage mess, not the least of which is that we know, right now, in advance, for a fact, when it is going to wane. We know, for a fact, that there are 2 million remaining adjustable subprime mortgages that have yet to play through the financial system (source: FDIC); and, we know that they will do so by July 2008. At that point, the fear that chased the billions into Treasurys and gold should pass. In that event, the billions should start coming back into the market, starting with investments that are seen as relatively safe (such as the highest-quality, lowest-risk preferred stocks - CDx3 Preferred Stocks). What do you think is going to happen to the market price of CDx3 Preferred Stocks once the billions of dollars currently parked in Treasurys and gold returns to the market? CDx3 Preferred Stocks, that CDx3 Investors have been (and will continue to be) able to purchase for, say, $23 should start to return to their normal pricing levels around $26 or $27 per share during the second half of 2008. The low market prices that CDx3 Investors took advantage of during 2007, not only produced CDx3 Preferred Stocks that pay very high dividend rates, but also set CDx3 Investors up for a nice capital gain, starting in late-2008. The current buyer's market (high dividend payers for low market prices) will continue for at least the first half of 2008; but, after that, the CDx3 Income Engine is poised to start adding huge capital gain income to the portfolios of CDx3 Investors. Preferred Stock Investing provides the web sites and other resources that readers need in order to start positioning themselves for this unique opportunity. For those who would rather not take the time, there is the CDx3 Notification Service. Subscribers to the CDx3 Notification Service receive an automatic email message whenever there is a buying or selling opportunity for CDx3 Preferred Stocks, and weeks in advance, too. See examples of the CDx3 Buyer's Notification and CDx3 Seller's Notification email messages and please consider becoming a subscriber to the CDx3 Notification Service. Start building your CDx3 Portfolio and set yourself up for high dividend income now, plus great capital gain income later. Last month, the U.S. Treasury announced a plan to ease the burden for those struggling with adjustable mortgages. Also, the Federal Reserve Board did their part by lowering interest rates once again (which many say is likely to continue well into 2008). Both of these policies are designed to hasten the end of the current mortgage crisis, which should bring the return of billions to the market. For CDx3 Investors, it all means that increasing market prices, and a corresponding return to a seller's market, is on the way for CDx3 Preferred Stocks that we purchased during 2007 and will be purchasing during the first half of 2008. Time will tell, but 2008 could very possibly deliver the highest capital gains on CDx3 Preferred Stocks that we have seen in many years. But, one thing is for sure - those billions are going to come back into the market at some point; and when they do, the market prices of CDx3 Preferred Stocks should go up, delivering substantial capital gain income for CDx3 Investors. Please consider subscribing to the CDx3 Notification Service and position yourself for great dividend income now, plus capital gain income later. 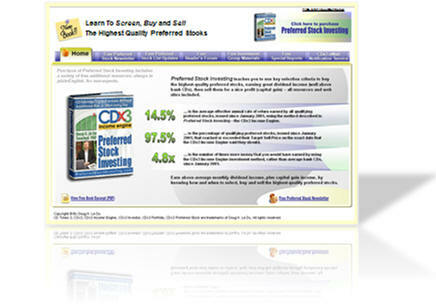 On December 26, 2007, version 3 of the PreferredStockInvesting.com web site went online. The new version of the book's web site showcases the large variety of free resources that are available to readers of Preferred Stock Investing. The original research into the market price behavior of certain preferred stocks, ones that meet ten specific criteria, began in 2002 and was the subject of an 8-page research paper in 2003. "You've got to write a book about this" was the most common reaction to that research paper. As the research continued, a web site, that we call "version zero," was created in July 2006 that did little more than provide a summary of the research and allow people to leave their email address to be notified once the book was finished. When the downloadable eBook edition of Preferred Stock Investing was first published on the Internet in October 2006, version 1 of the web site allowed web surfers to purchase and download the eBook. In June 2007, Preferred Stock Investing became available in paperback, and was updated to include all investment results through December 2006. Version 2 of the PreferredStockInvesting.com web site allowed readers to purchase the updated eBook edition or the paperback from a variety of retailers. free excerpt from Preferred Stock Investing. free Frequently Asked Questions (FAQ) library. 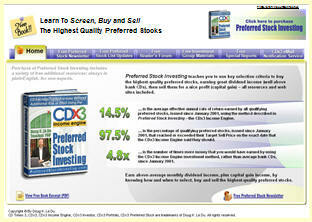 The new PreferredStockInvesting.com web site also provides information about the CDx3 Notification Service and allows readers to subscribe. Testimonials that I am thankful to continually receive from readers are also sprinkled throughout the new web site. Combined with snappy new 3-D graphics, transparent color effects and a brighter color palette, the new web site is packed with free resources, it's easy to read and simple to use. Click here, and a new window will open on your screen. Ever shop at any of these stores: Home Depot, Old Navy, Payless ShoeSource, Ralph's supermarket, Famous Footwear, Hollywood Video, TJMax, Kmart, Gottschalks, Ames, Bed Bath & Beyond or Ross? Then the chances are pretty good that you have shopped at a Kimco shopping center. Kimco (NYSE: KIM) is a $8.25 billion company that acquires, develops and manages shopping centers. And I don't mean just a few. 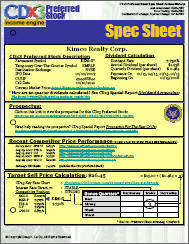 Kimco is the largest publicly traded owner and operator of shopping centers in the United States. Kimco (the name coming from founders Martin Kimmel and Milton Cooper) now has more than 1,500 shopping centers with 180 million square feet in 45 states, Puerto Rico, Canada, Mexico and Chile. Kimco, founded in 1960 and based in New Hyde Park, New York, now has 618 employees and reported a Q3/2007 (September) net profit margin of 43.76%. To see if you've been shopping at a Kimco-owned shopping center, click here. Last October, subscribers to the CDx3 Notification Service received a CDx3 Buyer's Notification that a new CDx3 Preferred Stock had just been introduced by Kimco Realty Corporation. There were two things that made this new CDx3 Preferred Stock interesting. First, at a time when the 90-day average dividend rate for new CDx3 Preferred Stocks was 7.417%, Kimco's new issue came out at 7.75%. That was enough to get most people's attention. Secondly, Kimco had not issued a CDx3 Preferred Stock since May 9, 2003; over four years had passed since its last issue. Because the market price of this investment grade CDx3 Preferred Stock is currently $23.10 (January 2, 2008), you would actually be making about 8.4% on your money if you were to purchase it now. Subscribers to the CDx3 Notification Service receive CDx3 Preferred Stock Spec Sheets for every newly issued CDx3 Preferred Stock, very often before they even start trading. Several subscribers are now anticipating a nice capital gain downstream, in addition to the 8.4% yield they are current earning in dividend income with this CDx3 Preferred Stock from Kimco Realty Corporation. Does a preferred stock have to be a recent issue to be considered a "CDx3 Preferred Stock," or do you also consider older preferred stocks? Do you provide lists of preferred stocks? - Earl M.
Yes, we provide lists of CDx3 Preferred Stocks, both for subscribers to the CDx3 Notification Service and for non-subscribers, but the timing is different. Subscribers to the CDx3 Notification Service receive a CDx3 Preferred Stock Spec Sheet whenever a new CDx3 Preferred Stock is introduced. Subscribers are also provided with an exclusive web site, just for subscribers. This web site is the home of the CDx3 Preferred Stock archive, where subscribers can find the CDx3 Preferred Stock Spec Sheets for prior issues. For non-subscribers, Chapter 9 of Preferred Stock Investing lists all of the CDx3 Preferred Stocks that have been issued since January 2001. Within Chapter 9, there is also a secret email address that you, as a reader of Preferred Stock Investing, can use to request updates to the lists in Chapter 9 (they are updated as selling activity warrants, but at least every April). If you want "real-time" notification of the newest, highest-quality, lowest-risk preferred stocks (CDx3 Preferred Stocks), plus access to historical lists and CDx3 Preferred Stock Spec Sheets, the CDx3 Notification Service is for you. Regarding Earl's other question "do you also consider older preferred stocks," Preferred Stock Investing presents the "three rules of market price predictability." Preferred Stock Investing documents three known forces that act upon the market price of CDx3 Preferred Stocks in a fairly predictable manner. One of these three rules is the "Rule of Call Date Gravity." CDx3 Preferred Stocks have a lifespan of five years, but you will tend to sell them within three years; here's why: CDx3 Preferred Stocks have a "call date" of five years from the date of issue. What that means is that the issuing company regains the right to buy your shares back from you, at $25.00 per share, five years from now. Until then, they have to continue making the quarterly dividend payments to you. Since you, and everyone else in the world, know that the issuing company could buy your shares back from you on a specific date five years from now, what do you think happens to the market price of your CDx3 Preferred Stock as that date approaches? It tends toward $25, of course; and that's the Rule of Call Date Gravity - the market price of a CDx3 Preferred Stock will tend toward $25.00 as the call date approaches. When does the market price start to come under the influence of the Call Date? About three years after a CDx3 Preferred Stock is first introduced (two years prior to the call date), the market price will start to trend toward $25. Therefore, CDx3 Investors tend to sell their CDx3 Preferred Stocks within three years - and now you know why. 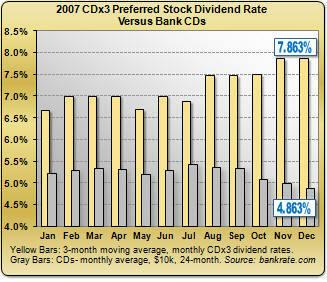 The CDx3 Preferred Stock archive includes the CDx3 Spec Sheets for CDx3 Preferred Stocks going back to mid-2006. Generally, as a CDx3 Investor, you would not want to consider preferred stocks that are any older, for two reasons: (1) they have much lower dividend rates than today's offerings, and (2) they are 1.5 years away from the point where the Rule of Call Date Gravity kicks in and starts distorting the market price. But, if you are interested in older CDx3 Preferred Stocks, see the tables in Chapter 9 of Preferred Stocks Investing; they go all the way back to January 2001. Thanks to Earl M. for the great question. You will receive a complementary copy of the CDx3 Special Report Dividend Accounting. If you have a question regarding the CDx3 Income Engine, just send an email message to FAQ@PreferredStockInvesting.com or visit the Preferred Stock Investing Reader's Forum, join the group (using an anonymous nickname) and post your question there for others to see. Fed Set To Meet In January- How Low Will They Go? As we start a new year, there is much for CDx3 Investors to look forward to. Preferred stock offerings are the preferred funding vehicle right now, as the credit crunch has made cash harder to come by than usual. America's largest, oldest and most successful companies are issuing CDx3 Preferred Stocks that pay some of the highest dividends that we have seen in years. With the huge supply of high-quality, high-dividend preferred stocks available on the market for buyers to choose from, market prices for these CDx3 Preferred Stocks are at bargain basement levels. These buyer's market conditions create two great opportunities for CDx3 Investors: (1) high dividend income now and (2) an enormous opportunity to sell your CDx3 Preferred Stock downstream for a nice profit (capital gain), since you were able to purchase them now at such a low market price. The Federal Reserve Board continues to lower interest rates and create innovative new ways for financial institutions to get a hold of cheap cash. The Fed meets eight times per year to consider their policies; the next meeting is a two-day affair scheduled to begin on January 29. I am anxious to report back to you regarding the activities of CDx3 Investors during the first month of 2008 in next month's CDx3 Newsletter. Remember, I'm not a stock broker; I'm not trying to sell preferred stocks to you; and I don't sell investment advice. I'm an investment researcher with a economics and statistics background who has developed a simple way to earn a respectable return at "CD-like" risk. And I've written it down in Preferred Stock Investing. I'm hopeful that you find these monthly CDx3 Newsletters interesting, and will consider learning more by purchasing my book, Preferred Stock Investing. Please take a look at http://www.PreferredStockInvesting.com. And don't forget about my FREE SPECIAL OFFER. P.S. : If you do not want to receive news regarding Preferred Stock Investing, just send an email message to OptOut@PreferredStockInvesting.com and you will be automatically removed from my address list. Best wishes to you. CD Times 3, CDx3, CDx3 Income Engine, CDx3 Investor, CDx3 Portfolio, CDx3 Preferred Stock are trademarks of Doug K. Le Du. All rights reserved. Company logos are trademarks of the indicated companies. Service Marks (SM) are service marks of the indicated companies. This CDx3 Newsletter is formatted for computer screens with a minimum of 1024 horizontal pixels as required for display on Google Groups. DISCLAIMER: The content of this CDx3 Newsletter is to be regarded as educational, rather than advisory. There can always be exceptions to trends and/or generalizations that may be discussed herein. Consider your financial resources and goals before investing. 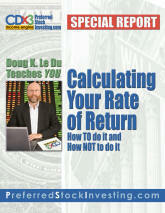 You, and not Doug K. Le Du, are solely responsible for your own investment decisions.